Sunshine has the power to lift most of us out of a bad mood during the spring and summer months – but the truth is that life goes on, regardless of the weather, and there are days when we’d all like to throw the alarm clock across the room and pull the duvet over our heads. For me, aromatherapy is the solution – but I’m aware that most people don’t have a library of essential oils to reach for when they feel down in the dumps! So I’ve done the hard work for you, picking out the essential oils that are widely believed to the most uplifting out there. There’s plenty of tempting beauty products that make use of their powers – so what better excuse do you need to restock your bathroom cabinet? Grapefruit Essential Oil is zingy, cheerful, and euphoric – so it’s ideal for days when you can’t shift a bad mood. If you have a vaporiser (and I really recommend you get one, as they make aromatherapy easy), treat yourself to a bottle of Tisserand Grapefruit Essential Oil, £6.15. Burn the oil as you get ready in the morning and you should feel your mood perk up in a matter of minutes. If you prefer, I’m also a fan of Roger & Gallet The Vert Fresh Fragrant Water Spray, from £12, which has top notes of Grapefruit, Yuzu, and Mandarin to wake up your senses and uplift your mood. Peppermint Oil is energising and uplifting, working hard to ward off sluggishness, irritability, and even headaches. I like the idea of getting a burst of minty freshness in the shower, so would recommend Fudge Daily Mint Conditioner, £5.08. The combination of peppermint and menthol top notes is infused into a base of cool ice coffee. Better still, the scent clings to hair, so it’s a great way to keep the scent with you all day long. Lavender is known for its ability to relax and help us drift easily off to sleep – but it’s also great at banishing feelings of stress, anxiety, and worry. Best reserved for evenings, I love lighting a fragranced candle – and my top pick is the Crabtree & Evelyn Lavender Poured Candle, £19.20. Alternatively, Reed Diffusers are a big trend in home fragrance right now – and Crabtree & Evelyn Lavender Fragrance Diffuser, 10 reeds for £24, works equally well. It’s not an obvious choice, but Coriander is often referred to as ‘The Herb of Happiness’ for its ability to cheer us up when we’re feeling sad. It’s a green, fresh scent that isn’t used that regularly in beauty products – but Crabtree & Evelyn Citron, Honey & Coriander Hand Therapy Cream, £11.35, is a wise choice for days when you need a boost. Another option is Marc Jacobs Splash Ginger Eau de Toilette, £24, which contains top notes of Coriander and Cognac. Splash it over your skin on the warmest days to perk up your mood. My favorite handcream from Crabtree& Evelyn. Easily absorbed through my skin, gorgeous scent.This is one of my favorite winter handcreams. If you have very dry hands, gardener's handcream may be more suitable for you. 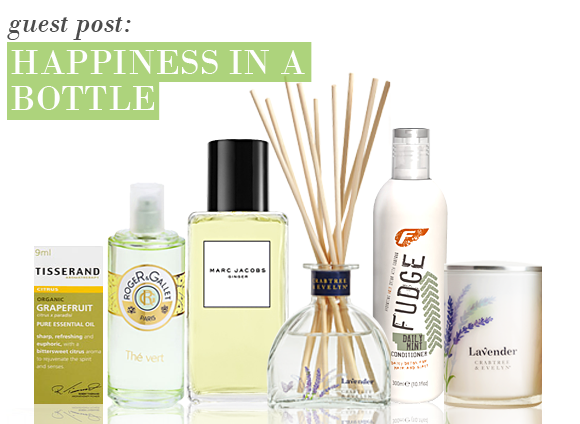 This entry was posted on Monday, May 28th, 2012 at 8:51 am and is filed under Fragrance, Guest bloggers. You can follow any responses to this entry through the RSS 2.0 feed. You can skip to the end and leave a response. Pinging is currently not allowed.